Close More Sales By Making Your Prospect Feel Important! John Dewey, a 21st century renowned philosopher, psychologist and educator said that the need to feel important is a basic law of human nature. When you are contacting your sales prospect, engaging in conversation with them and even speaking with their gatekeeper it is so important that you apply this law of human nature. While this concept is common sense one could argue that it is not common usage. Why is this true? Because many of us get caught up in everyday life and we forget how important it is to make others feel important. How do you bring these �common sense principles� from your subconscious to your conscious mind? It�s called awareness. When you become more aware of this principle and use it in your everyday life you will find yourself closing more sales. Do you want to get started? Below are ten practical ideas that you can immediately use to make others feel important. 1. The Importance Of Remembering And Using People�s Names. "Excuse me, what is your name again?" Have you ever found yourself saying this? I must admit that this has happened to me many times. One creative idea to remember the names of others is to think of a moviestar soon after you have learned your prospect�s name (or the name of their gatekeeper). So for example, a man�s name is Harrison then think of Harrison Ford. Or, if a woman�s name is Sandra then think of Sandra Bullock. Another strategy is to write the name of your prospect down on paper. This idea works well if you are dealing with gatekeepers or if you find yourself being transferred from one person to the next to reach the correct decision maker. In regards to using people�s name, I would suggest that you use your prospect�s name at the beginning, middle and end of your conversation. Also, when you send them emails make sure you use their name in your email to them. Further, I would also make sure that when you speak with the gatekeeper that you politely ask them for their name. How many times have you not asked for the gatekeeper�s name and just said, �Can you please transfer me to (Name of your prospect).� How about if you said, �May I have the pleasure to know your name? Once you know their name I would say their name and then ask to be transferred again to your prospect. As a final note, I would record the name of the gatekeeper in your call notes so the next time that you call you make your prospect�s gatekeeper feel important! 2. The Importance Of Sending Handwritten Thank You Notes. How often do you find yourself sending emails rather than sending a thank you note? The reason most likely is because it�s easier to send an email then to take the time to send a handwritten note. In regards to sending emails and making your prospect feel important, I usually send an email to summarize or confirm what we had spoken about over the telephone (i.e. you set up a time to meet with them). In regards to sending thank you notes, I recommend that you send a thank you note to any prospect in which you have spent more than five minutes on the telephone with. Also, if your prospect does not return your telephone calls, I would suggest that you send them a hand written note that you have been trying to reach them. When you take the time to write a thank you note then you are letting your prospect know that they are important. 3. The Importance Of Timely Following Up. Have you ever been in a situation when someone has said, �I�ll call you tomorrow and give you an answer to your question.� Did this person call you? If they forgot to call, how did this make you feel? Were you annoyed that they did not call? This type of example happens a lot so the next time that you promise your prospect something make sure that you follow thru with your word. Your word is your signature. 4. The Importance Of Sending Articles That Your Prospect Would Find Interesting. I believe that if you take the time to send your prospect an article of interest then your actions imply that you have taken the time to really get to know their business and what they do. Think about it, how would you know what to send to them if you did not take the time to get to know them? If you are reading an article that your prospect might find interesting (i.e. like this Mr. 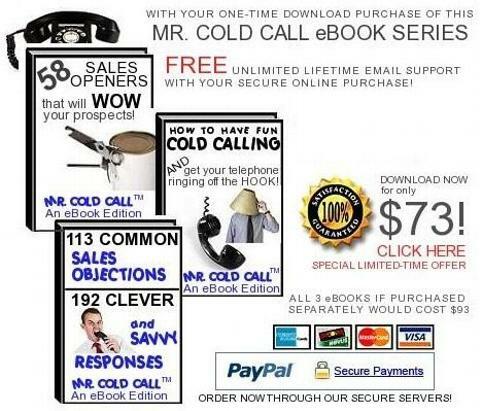 Cold Call article) then email it to them or print it up and send it to them with a short handwritten note. 5. The Importance Of Listening More And Asking Good Questions. How much should you listen versus talk when speaking with your sales prospect? The most common percentages that I have come across are 70% of your time should be spent listening to your prospect, while the other 30% of your time should be spent speaking with or asking your prospect questions. When you listen to your prospect you are making them feel important. When you ask your prospect questions you are making them feel important. These percentages will help you to adjust your ratios so that you spend more time listening to your prospect and understanding what they may need so that you can help them. 6. The Importance Of Taking Good Notes About Your Sales Prospect. When you have completed a telephone call with your sales prospect take a few minutes after the call to record a few key points about them. I would record information about their professional objectives as well as personal information about them. When you call them back and incorporate key points that you have learned from previous conversations then your actions will make them feel important. 7. The Importance of Making Sure That You Know Your Prospect�s Industry. The most obvious way to get to know your prospect�s industry is to research their website or read trade publications. Another great way to really get to know your prospect�s industry is to only contact prospects in a specific industry. For example, spend a few weeks calling on just one industry (i.e. pest control companies or moving companies). This way you learn firsthand from experts in that industry what they are experiencing and bring that information that you have learned to the next prospecting call. 8. The Importance Of Finding Things That You May Have In Common With Your Sales Prospect. Many websites have a section reserved for management profiles. Read these biographies to see if you may anything in common with your prospect. Maybe your prospect attended the same college as you? Maybe your prospect grew up in the same town or area as you? The more that you can find in common the better! I would try to use this information that you have in common early on in your telephone conversation. For example you could open your sales call with the following: �(First name of prospect), as a (Say year here) graduate of (Name of college) I�m hoping that you will take my call today? (Pause and then smile on the phone). This is (Your name) calling from (Your company) and the reason for my call today is (State the reason for your call). 9. The Importance Of Being Patient When Your Prospect Asks You A Dumb Question. Have you ever been in a situation where you asked someone a question and they responded with a sarcastic tone and said, �We already went over that question!� Or maybe the response was not exact, but similar? How did this make you feel? �If a customer asks you a really dumb question be patient and answer their question. No one is perfect and sometimes things that are common sense to you are not common sense to others. 10. The Importance Of Smiling Because When You Smile It's Contagious! Smile as much as you can on the telephone. While your prospect cannot see you smiling, they can sense the tone of the call and your smile has the power to influence others. Always remember that if you ask for the order with a smile you can really be unstoppable!